More birches! These two are very nice together and, in fact, I painted them at the same time with the same palette of primary colors - one that works especially well with autumn paintings: cadmium red, french ultramarine blue and cadmium yellow. The scene to the left is inspired by a view that I like in the White Mountains of New Hampshire. There is a mountain road that twists and winds through the mountain range from East to West called the Kancamagus Highway. Along this road on the eastern portion is a stony river. You might see it behind the trees along with a peek at a mountain top in the distance. 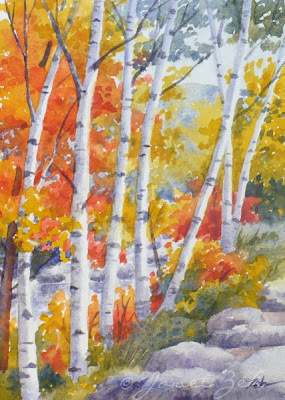 White paper birches line the roadside in many places like in this painting which is 7"x5" painted on handmade watercolor paper. Paper birch trees, with their bright white bark that glows in the sunlight are a favorite of mine. I enjoy painting these lovely trees especially in autumn when the maples and oaks lend color to the background. To the right is a grouping of four birch trees also 7"x5" and painted on handmade watercolor paper. 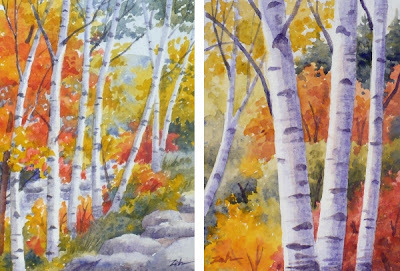 Both of the original Birch Tree Paintings are sold. 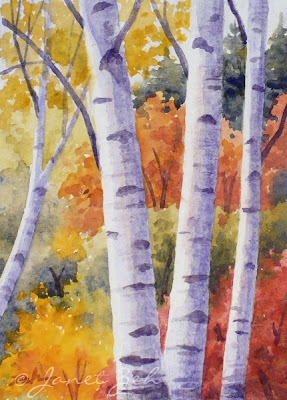 But fine art prints on watercolor paper or canvas are available in my Fine Art Print shop here: Birch Trees Prints.